10 awesome ways to exercise with your dog! We all know that dogs, the little (and sometimes big) bundles of energy, enthusiasm, and excitement need their daily exercise. Veterinarians agree that on average, dogs should participate in one hour of exercise per day for their physical well-being. And it’s good for their humans’ too! The research from Michigan State University found dog owners were 34% more likely to get the recommended 150 minutes of exercise a week than folks who didn’t have a dog. Virginia and ‘Peru’ enjoying a swim in the freshwater lake. Things to consider before you exercise with your dog? The breed of the dog, genes, age and current health status play a role in determining the best exercise plan for your dog. Breed – Breeds like Labradors, Jack Russell Terriers, Border Collies and Golden Retrievers love high energy work-outs and thrive on it. In many cases, anxiety and behavioral issues in high energy breeds can be alleviated by more physical activity and social interaction. On the other hand, Pugs and English Bulldogs due to their narrow nostrils get tired after long walks. Short walks during the coolest time of day are recommended for such breeds. Age and health – if your dog has a history of any medical ailment, operations etc., be sure to consult with your veterinarian before starting a new exercise plan. This blog post explores the exercises for your dog to keep them healthy and fit! 10 ways to exercise with your dog! Walking – As simple as it sounds, walking not only keeps your dog engaged but also strengthens your bond with him. Ensure that you choose mornings or evenings, because of the relatively lower temperature. Try walking longer but at a slower pace so that your pooch can take in the scents, sights, and sounds. You may also include some jogging toward the end. Running – Dogs make the best runners! You’ll never hear them complain of the rains, the terrain or the time. Once you get your dog into the routine of a morning run, she will ensure that your exercise is also taken care of! Running (or jogging) with dogs takes some work and training so that you and your dog maintain an understandable pace. Hiking – Hiking is a great way to make your daily walk more exciting and challenging for your dog. It might be a climb up the hill, soaking in beautiful scenes or a fun holiday involving a lot of nature walks. Dogs love to explore and in them, you’ll find your perfect hiking companion! Running your dog up and down the stairs – Running the stairs is a great exercise in a dog’s workout, as they engage different muscles than those used on a regular walk or run and add an extra level of difficulty with the change in elevation. Fetch – Engage your dog in a good old-fashioned game of fetch and keep away. These games keep your dog engaged, active, and help to release pent-up energy. Stand on Hind Legs & Stretch – Use a treat to lure your dog to put his front feet up on a chair or on you. Now let him stand and reach out for the cookie or your loving caress. This exercise helps your dog stretch his hips. Shrida & Buffie show how to do stretch and reach exercise. Hide-n-Seek – Remember the good old childhood days? Hide somewhere and whistle or call out your dog’s name. Now, your dog has to find you. Ensure that you reward him when he finds you. Trace the Scent – We all know about the dog’s great sense of smell. This exercise tries to challenge our dog to find treats hidden in the room. This encourages your dog to look from place to place in search of the prize and also develops your dog’s focus and confidence. Swimming – With the mercury rising to unbearable heights, there ain’t nothing like a dip in the cold waters. 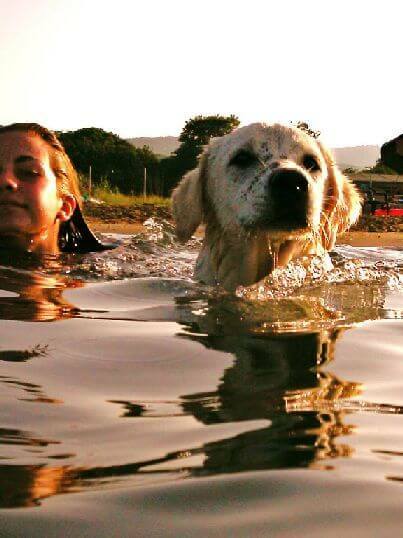 Swimming certainly is a great way to exercise with your dog and it helps keep your dog safe in summer. It serves the dual purpose of exercising and bonding with your dog. Look out for water bodies near you where you can take a safe plunge with your dog. There are some clubs that offer dog-friendly pools or you can look out for the fresh-water lake nearby, or even invest in a kiddie pool for your backyard. High Jump – All you need is a carton or overturned chair and some encouragement for your dog to jump over. Raise the height as your dog becomes more limber. Have more tips on fun ways to exercise with your dog? Please share with us in the comments below. Posted on May 22, 2016 January 3, 2018 Author Abhishek JoshiCategories Dogged reviews!